hi everyone. my first post here was about building simple linear amplifiers. 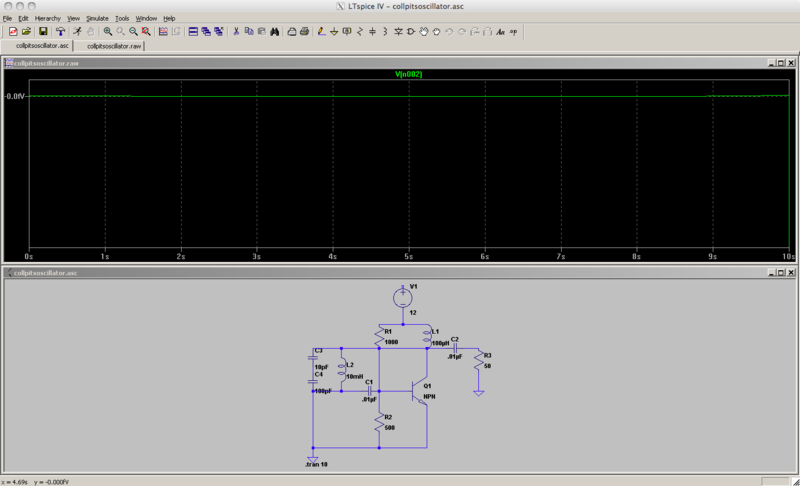 my next goal is to learn how to make a decent oscillator that i can use in various hf projects in the future. i have a copy of the 2011 arrl handbook which has a really great chapter on oscillators which i have been reading but i think i need some advice from you guys. i would like to know what you think would be a really useful type of oscillator for someone fairly new to radio. should i try to build a vfo, vfxo, or frequency synthesizer? colpitts, series tuned colpitts, hartley, butler crystal, some specific pll ic, something else? the arrl handbook has tons of designs and i'm sure theres countless more out in the field. what i am hoping for is something simple enough for me to be able to understand how it operates and which can operate on the whole hf spectrum. i dont mean i want one oscillator that can tune over 1.8-30mhz but rather a design that can be tweaked for various hf applications. This is s great way to learn! Over the summer of my junior year in high school while not working at the Chevron station, I basically built every HF oscillator type described in the Handbook and in a military manual that an Army tech gave me. I used old TV and radio parts. Transistors - tubes whatever, it did not matter, I built them all up on a pine board. My power supply was a 9V battery and for the tubes, an old radio transformer power supply with 150V and a 6.3V for the filament. You would be surprised what you can learn from a 2N2222 or a 6J5. If you are mathematically inclined, just a little bit, an excellent paper and book by Clarke and Hess, treats the subject of oscillators in an extraordinary way. Also, as I recall, you have LT Spice. Once again, I encourage you to try the oscillator examples included in the program. 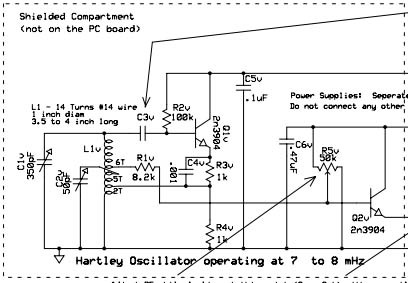 However, if you are anxious to melt solder, than the direct answer to your question for L-C oscillators, is the Hartley configuration. I suggest this configuration mainly because it is mechanically a bit easier to configure then the others. If you don't have a box of CAPS, you only need one coil suitably TAPPED to provide feedback and just ONE CAP to form the completed resonator (or TANK). Add your 2N2222 and you are off. However, what is more exciting, is build the same design in LT Spice. The agreement with bench measurements is quite incredible through several 100 MHz! the example circuits in the arrl handbook didnt have specific values for the tank circuit components so i was pretty surprised to see the inductor value being given on that website in millihenries. that seems huge! every inductor i have worked with has been in the microhenries range. i would imagine winding a coil in the mH range to take hundreds of turns on ferrite. should i be try to wind my own or do you guys buy them when they have such high values? if you wind them, what type of core do you use and what size? Avoid using toriods, unless you get the most stable mix. They're hard to wind and not adjustable. Better is ony of those old Miller slug-tuned ceramic forms. Use the best quality capacitors you can in the tank circuit. Silver micas or ceramic NP0s. Temperature compensate with a 10 pF or so N750 to start, then adjust as necessary. Use air-variable trimmers if possible instead of mica compressions. Use a single point ground for all components - ie ground the coil (if applicable) any trimmers, and the active components to one spot. Use a regulated PS with plenty of bypassing at RF. Best bypass is a .001, .1, and 10 uF caps all in parallel. Strive for mechanical rigidity. A cast aluminum box, or thick plate, makes the best mounting. Use the lightest coupling possible from the tank to the active device that sustains reliable oscillation. This ensures the tank Q is at its highest, gives the lowest phase noise, and best stability. Avoid using those clipper diodes in the base circuit that you see in many circuits. If you're blowing FETs due to RF voltage on the gate, reduce the supply voltage and reduce the coupling to the tank. The clipper diodes create phase noise and drift due to their capacitance. The L/C ratio is important. Use as low a L/C ratio as you can get away with. Caps are more stable (physically and electronically) than coils. Don't even consider using an oscillator to drive something else without using a buffer circuit. This is a really nice aide to designing the tank, if you're building a superhet. You can use it just for the oscillator, just enter "0" for the IF frequency. Ignore large padder values, just delete the padder capacitance unless you don't have an adjustable coil then use a varaible padder in parallel with other larger caps. wow thats a great list of tips. would it be better to use a fixed or tunable inductor? any reason i would need a high current rating? i know that the inductor values are relative to what capacitors i use but is there a general range i should be looking for if i want to be oscillating in the range of 1.8-30MHz? i think i better listen to W4AMV and try assembling something in lt spice before i start buying parts. edit: oh interesting. the colpitts examples in ltspice use smaller inductors (100uH) and larger capacitors (500pF) compared to the electronics-tutorials.ws example i posted earlier. what difference does it make to have larger inductors versus larger capacitors? edit2: w3jn, with regards to that superhet site you linked, what is the aerial circuit? and is the padder the unlabeled capacitor in the circuit? Keep it simple and use a couple of Radio Shack MPF-102 FETs to start. The first FET is the Colpitts (actually this variation of the Colpitts is called a Clapp oscillator). The second is a buffer. Your power supply should be regulated. A 6.8V zener or a 7806 or 7805 make a good supply for this oscillator. This oscillator will make a good VFO or HFO for a receiver. The coil can be solid # 16 to #14 preferably enamel covered wire, wound on a 1 Inch Dia. piece of PVC pipe about 3 inches long, securely mounted to your breadboard. Lets say we want something in the 80M band. With about 120 pf of capacitance (100 pf fixed silver mica cap and a 20 pf air variable on a vernier dial) we would need about 15 uH of inductance to hit 3.7 MHz. This turns out (pun) to be about 15 turns. Once happy with the number of turns, cement them down with Epoxy. The FET source RFC can be about anything from 500 uH to 2.5 mH. In fact a 1K resistor may work. i just did a couple ltspice tests. i have a 400pF air variable capacitor so i entered min and max tuning capacitor values of 10pf and 400pf. i arbitrarily enter 1.8 and 3.5Mhz as the low and high frequencies. i assumed that was what sets the tuning range of the oscillator but when i loaded the model up in ltspice i had a range of ~2mhz to ~10.5mhz when i adjusted C2 from 400pF to 10pF. i didn't include any of the other caps from the circuit because the website did not list any values and w3jn said to skip the pad capacitor. this one didn't work at all. WU2D, which schematic are you referring to as a clapp oscillator? The All time best cap for an oscillator circuit is the tuning cap out of an old BC221 with the spring loaded worm gear drive. 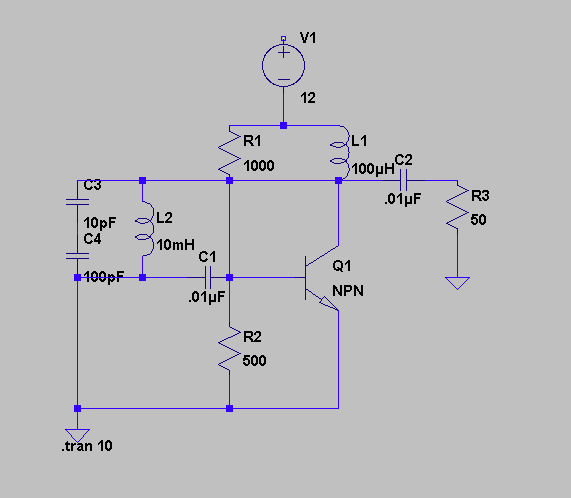 The circuit you posted has no feedback and it's just an amplifier with a resonant input and no input signal. In that superhet program, the "aerial" circuit would be the RF stage in a superhet receiver. It's meant to calculate components to make sure the RF and oscillator circuits track each other. In our case all we're interested in is the oscillator. The padder is there to make sure the oscillator tank range tracks the RF tank range, at the correct variable cap settings. Your 10 pF-400 pF cap is way too wide. I'd throw a 100 pF cap in series with it to narrow its range a bit (yep, that's a padder). Those RF chokes you pointed to are not made for oscillator service. Probably too much parasitic capacitance and definitely not temp stable. Best way is to wind your own. A piece of PVC pipe might even make a decent form, at least to experiment with. Don't close-wind (space your turns at least a wire diameter or two) and use enameled wire (PVC or other insulation isn't mechancially stable). By winding your own you can also include the feedback tap for a Hartley circuit. oh adding a 100pF in parallel helped quite a bit. now when i adjust c2 from 10 to 400pF i get a frequency range of 1.6 to 3.5MHz. if i wanted to make the oscillator switchable between multiple hf bands should i have different tank circuits setup on a rotary switch or is there a better way? as far as that other circuit.. isnt there feedback from the collector to the base via the tank circuit? 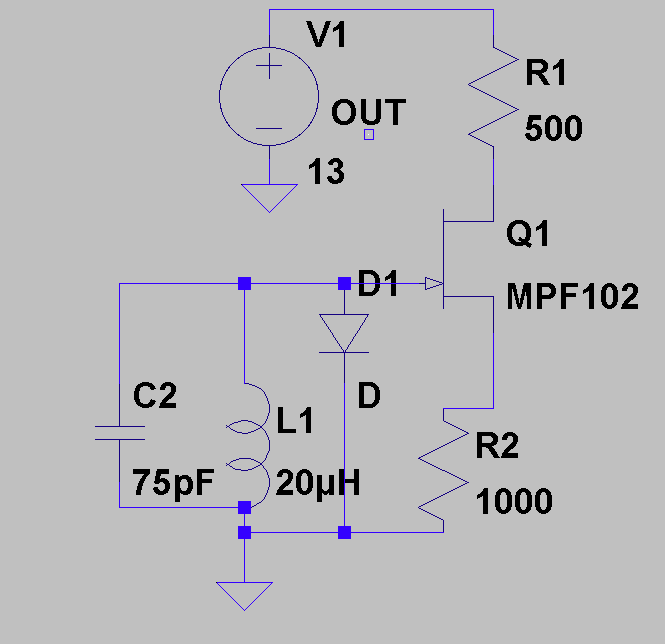 how is it different from this circuit: http://www.electronics-tutorials.ws/oscillator/osc13.gif ?? edit: and what exactly is a buffer circuit? wikipedia says "A buffer amplifier (sometimes simply called a buffer) is one that provides electrical impedance transformation from one circuit to another." is that the same thing as a matching network? edlt2: WU2D, sorry i asked a silly question about what schematic you were referring to. i didn't see the attachement to your post. thanks! A buffer is just a single stage amplifier. Could have no gain (like an emitter follower) or have some gain. The purpose is to isolate the oscillator from the load. A variable load will mess with the oscillator stability. You could switch the tank with a rotary switch, that's the way receivers have done it prior to the synthesized era, but switches will introduce instability. Collins receivers using a PTO do not bandswitch the variable oscillator and hence are extremely stable. i was ultimately hoping to be able to use this oscillator (or whichever one i end up building) in qrp transmitters. are these designs stable enough for transmission? In the Bipolar NPN, select an actual device, do not use the generic NPN device. Try again. In the FET ckt change the 500 ohm to 50 then to 5000 and run and check the frequency. You can use the time marker reading or use the FFT function. This is a good example of what the buffer fixes. What does the frequency do for those 3 cases and WHY? oh, the reason the FET circuit does work, per last post, is you used a "real device" and there is intrinsic feedback present. In this case gate-to-source capacitance. Again, in the case of the bipolar, try a real device, not the ideal BIPOLAR model. And finally, remember these are all models (devices, etc...) and in the end you do NEED TO BUILD these items. These simulations are just approximations. As a rule... if it works in simulation, it may work on the bench. If it does not work in simulation, it may still work on the bench, however, it is key to understand where is the disconnect. Finally, don't trust the simulator, but do trust the trends they predict. All that said, it is incredible many times to see how well they do predict operation. If that is the case, pat yourself on the back, you have good models! i see what you mean about simulations not always matching up with the actual components. i put together one of those fet oscillators using a mpf102 on my breadboard. i haven't made a coil yet so i used an 18uH axial inductor i had laying around. maybe its the reason this didn't work but the circuit was oscillating at about 11MHz 100mV Pk-Pk regardless of how i adjusted my air variable capacitor. 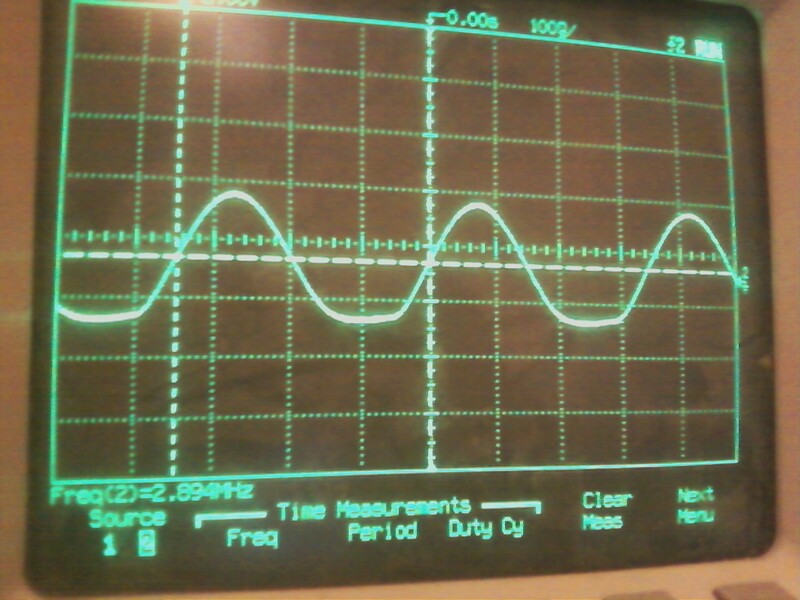 the sine wave looked really messy and was not stable at all. 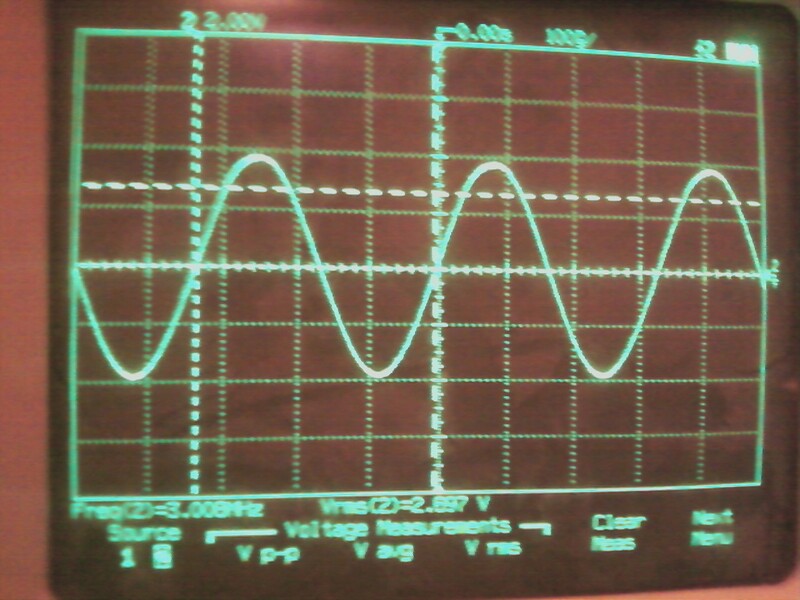 if i moved my hands around near the circuit it i would see the sinewave move around on my oscilloscope. 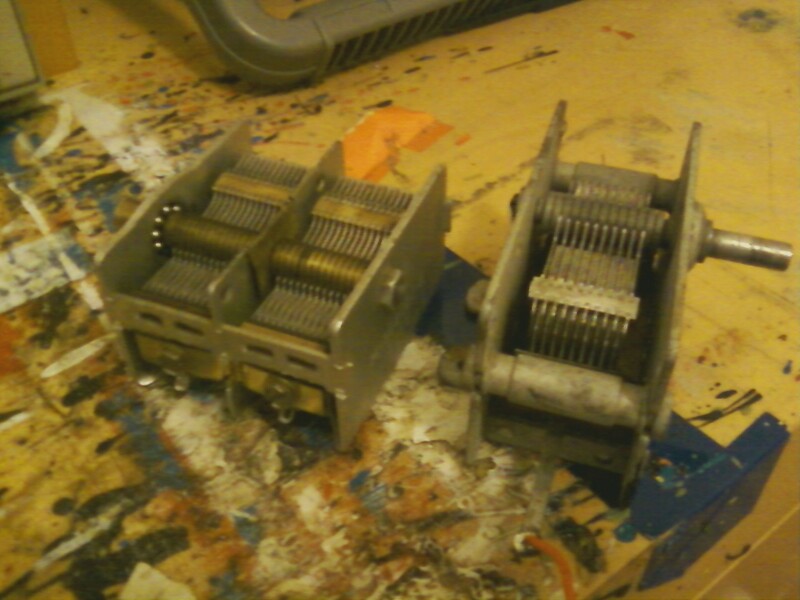 i tried two different variable capacitors, one is 600pF and the other is 400pF. i had the capacitor connected to the circuit using alligator clips. i tried i removing the alligator clips and used short lengths of wire to attach the tuning capacitor to the breadboard. this caused the circuit to stop oscillating. The clip lead is acting like an inductor and its capacitance to the rest of the circuit is acting like a higher-Q circuit than your molded inductor (see why you don't use those in an oscillator?). Short, stiff wiring and a single point ground and/or a good ground plane is the order of the day for more or less predictable results. the circuit stops oscillating when i connect my air variable capacitor. edit: i didn't have any mylar capacitors and had to use ceramic discs. could that have something to do with whats happening? 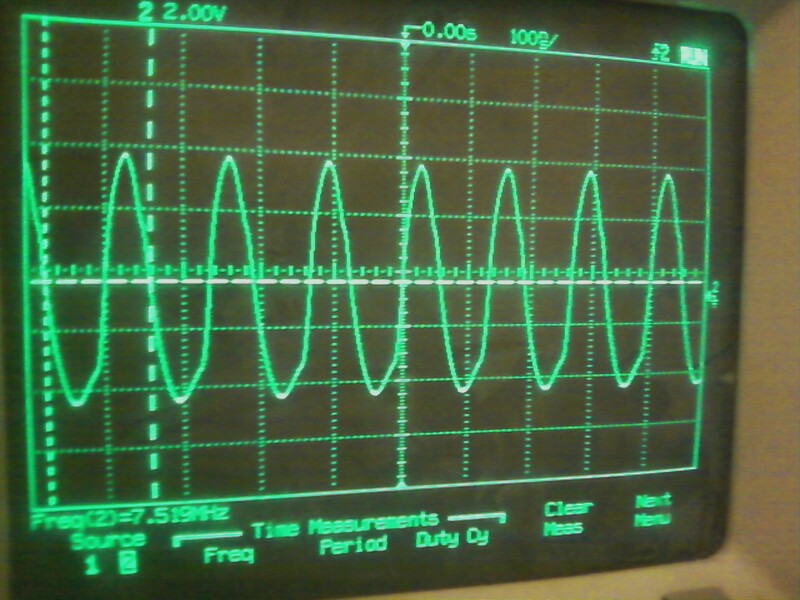 I remember my first oscillator, a tuned plate tuned grid using a 2A3 and a 300V power supply. The result was my father coming into my room, asking me what I was doing, and letting me know he was not happy about the TV reception. that sounds crazy opcom! how much power was that thing putting out? at 5MHz the sinewave looks really great but at any higher frequency it starts to get deformed. is there some way i can troubleshoot them and make sure they aren't damaged? i did do continuity checks and nothing seems to be shorted in them. and based on the number of turns and it's dimensions the coil is only about 4.7uH. i'm going to make a better coil as soon as i can find some scrap pvc. is there a particular inductance value i should aim for? The 7 Mix toroid is very stable even with a very low power tube oscillator. Just dont get the smallest you can find, a T68 or larger is better. Those old cheap slug tuned coils were far from stable but maybe OK for just AM. OTOH a large diameter one from a scrapped old high end radio will be fine. This is what I use (I use completely homebrew oscillators for everything). This is easy to build, and is fairly foolproof. The neat thing about it, is that it uses a DIVIDER rather than a multiplier. In this way, you can leave the oscillator running all of the time, and never hear anything bleeding through on the fundamental frequency. 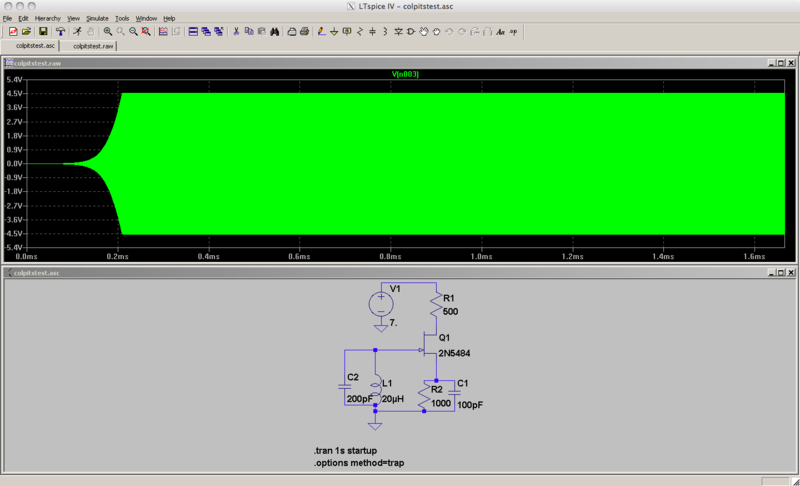 Here is the oscillator-only schematic. And, here is the complete VFO article with schematics, plans, pictures, etc. heres what the schematic looks like. the tank cap is air variable but i dont know how to draw a variable cap symbol in ltspice. this circuit doesn't work in LTSpice without a capacitor from source to ground but in real life the sinewave looks better without one. just for fun i tried putting both of my home-made coils in the circuit. this bumped up the frequency range to ~5MHz to ~13MHz. 1. what can i do to clean up the waveform? at lower frequencies the bottom of the wave is slightly flattened and at higher frequencies the top and bottom of the wave have lumps. 2. how should i tweak the tank circuit so that adjusting the tuning capacitor gives me a more fine grained control over one specific band? 3. on a related note, it seems that the higher the inductance of the tank circuit the lower the frequency range. is this correct? if so, is it possible to have a tank circuit with one inductor in it that is adjustable between all the hf ham bands or do i need different coils for each band? 1. 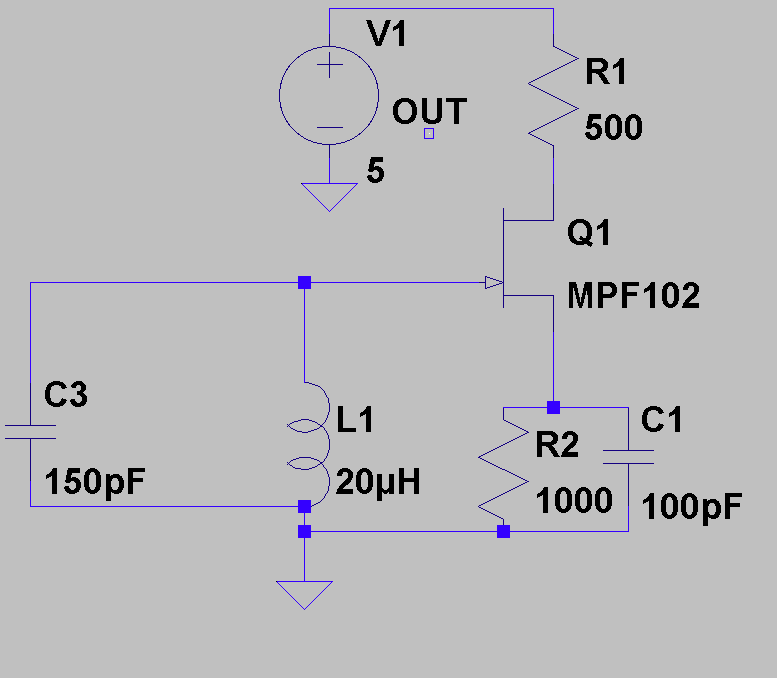 Filter the output with a lowpass or bandpass filter. 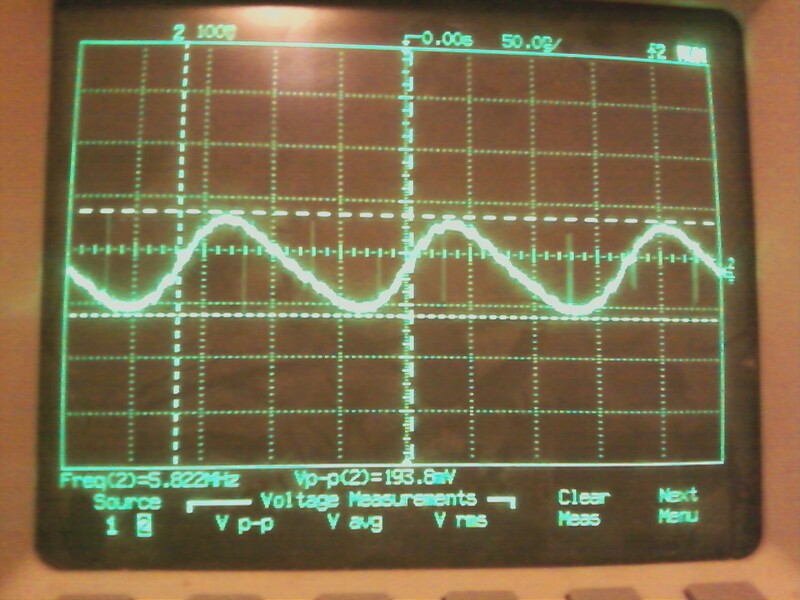 If your waveform is distorted you're most likely overdriving the transistor. 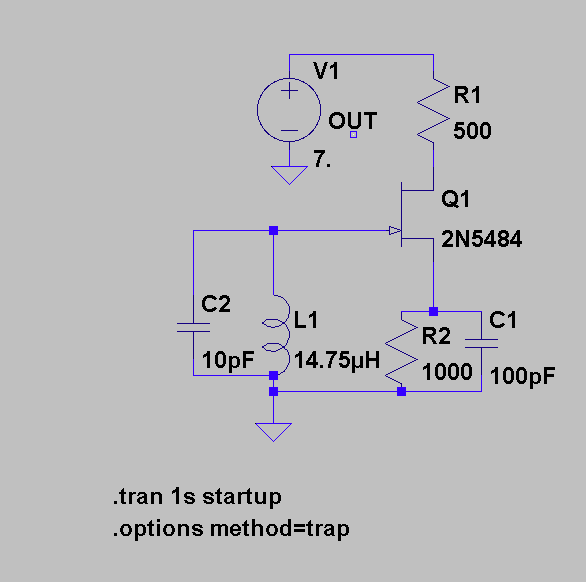 Reduce the feedback and/or coupling from the tank to the transistor. 2. 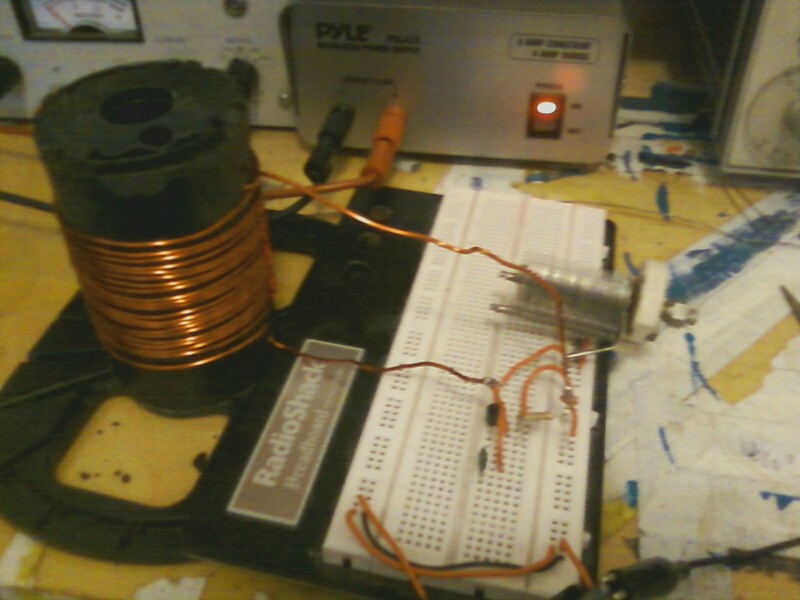 Put a fairly large amount of FIXED capacitance in parallel with the coil. If you have a 75 pF variable cap put 300 pF or so in parallel with the tank. This reduces the influence of the variable capacitor on the tank. Alternatively (or in combination with the above) put a capacitor in SERIES with your variable. 3. Yes. And no, that's not practically possible for an oscillator. i feel kind of dumb, i had been changing parts around a lot and things got a little confusing. i took the whole circuit apart and put it back together and now the waveform looks great. for whatever reason i can't have more than about 150pF in the tank circuit otherwise it stops oscillating, but i have 100pF in parallel with the variable capacitor (which i now think is closer to 50pF) and the full rotation of the cap is a 1MHz sweep. is it normal for the voltage to increase or decrease depending on the frequency of the oscillator? this is really exciting. 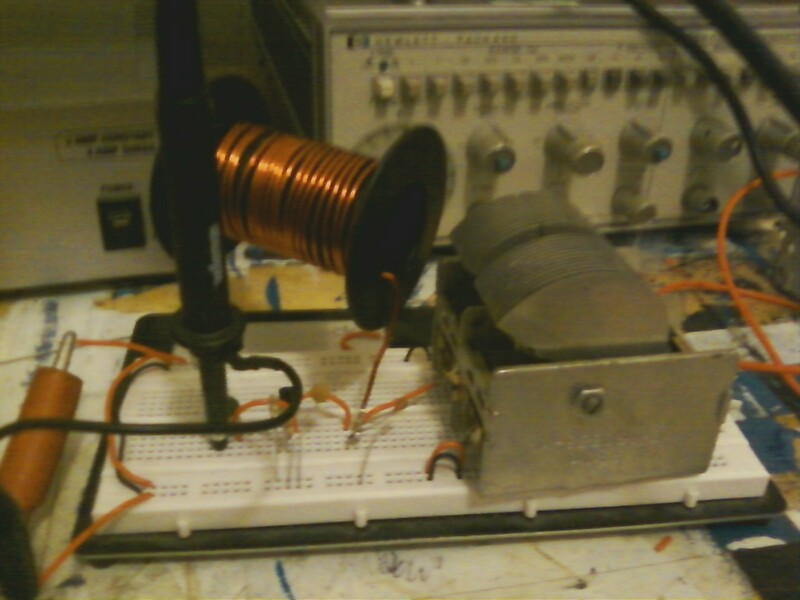 i guess the next step is to build a nicer coil that gets me onto a specific band and add a buffer circuit.